Tomorrow afternoon, Porous Walker will be at Receiver Gallery leading a hands-on workshop on how best to glue old toys together. Assemblages will be assembled and then mounted along Orange Alley out back. Party starts at 2PM. Cookies by Anthony’s. Had a great time at the opening of Receiver’s latest show “Me vs Me”? Want more Porous Walker/Jimmy Dimarcellis but just don’t know how? Come by Receiver this Saturday at 2pm and glue toys together with Jimmy. 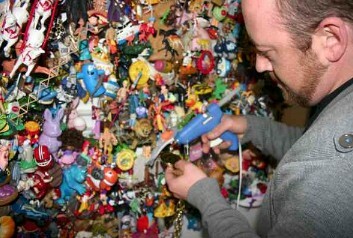 He’ll give a brief talk about all the work in this show and then lead everyone in some good old fashioned toy-gluing. Once we all have sufficient toy assemblages, we’ll go around back to Orange Alley and install these little art show supplements about, extending the show beyond the gallery right into the community. Please come at 2pm with your own glue guns or with whatever be your prefered plastic toy gluing medium. Plain old Elmer’s probably won’t get the job done. Bubble gum just works in the movies. We have a few glue guns but, by and large, this will be a BYOGG event. Thank you. Jimmy also has quite a few extra toys, but please if you can bring your own, do so. See you on Saturday! And, as usual, treats will be provided by our neighbor Anthony’s Cookies. Please let us know if you can make it! And if we don’t see you there, be sure to come to our next show featuring technicolor costumes, paintings, installations and fabric by San Francisco artist Sarah Applebaum opening May 23rd. This is going to be the best afternoon of everyone’s life who attends, says me who is putting it on. Porous is one of my favorite people. No thanks, I will be masturbating. OK, kidding, sorry. Just something about toys and sticky hot liquids. Carry on. btw, don’t go to anth’s just for the cookies…go for marcus’ smile. it’s like smooth creamy white strauss milk. i got a dozen!